Automated Parcel stations also help in solving the critical aspect of last mile delivery such as cost advantage, single day delivery and accommodating increasing demand. Research has shown (Gevaers et al., 2014) that when the route distance remains the same and the number of parcels drops could increase the price per parcel is set to drop. Thus, the density of an area is correlated positively with the number of drops a driver can execute during his route. If a consignee, for example, lives in an area with a density of 0-50 inhabitants (€7.75) the number of possible drops that a courier can perform will be lower thus tripling the cost (€2.75) of delivery compared to an inhabitant living in an urban area with a density higher than 1500 inhabitants (Gevaers et al.,2014). Clear it can be seen that Automatic Parcel Stations is cost efficient over traditional delivery. Compared to the high percentage of failed home deliveries, parcel lockers do not suffer from this issue it is assumed that the first time hit rate is 100% thus saving costs by not having to re-deliver and redistribute the parcel (International Post Corporation, 2010). By bundling goods and having them delivered at one location saves time and costs. Finally, due to not having the personally deliver the parcel at each recipient’’ house, it will lead to more optimized delivery routes. These factors lead to reduced operational costs (Gevaers et al., 2014). The Automatic Parcel Stations have converted delivery from B2C model to B2B model and therefore problems such as missed delivery, ‘not at home problem’, the high transit time of delivery executive, and inability to find the address gets solved. This not only increases the cost but also total time to delivery. On the contrary, Automated Parcel Stations logistic companies deliver the parcel at a set specified location which is generally at well-known locations. Therefore, the overall turnaround time of logistic companies gets decreases and therefore E-commerce, as well as logistics companies, can promise single day delivery with greater ease (Gevaers et al., 2014). Automated Parcel Stations also flexible in catering increasing demand. This is primarily because of the fact that Automatic Parcel Stations are facilities which require high initial investment and low operation expenditure. Also, the incremental cost of operations is not high. Therefore, even if demand increases the same facility may be used provided it is underutilized. However, in case of the traditional delivery model, every additional demand requires additional delivery cost because the traditional delivery model is based on low capital expenditure and relatively higher on operational expenditure (Gevaers et al., 2014). As mentioned above that Automated Parcel Station has the ability to solve last mile delivery problem. Also, it has been understood that it will be an additional intermediary in entire value chain of E-commerce business. After selecting the items, consumers may put those items into the basket for purchase. 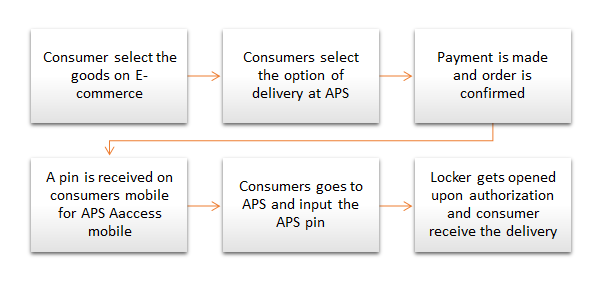 At the same time, consumers select the option of PopBox APS for delivery. Post that, consumer reconfirm the order and make the payment. Upon successful purchase of the order, consumer gets a pin for accessing the locker at Automated Parcel Stations of PopBox. Once delivery of the goods at APS is confirmed by E-Commerce Company, the consumer can go to APS any time, and use the password sent to her for accessing lockers. Upon successful entry of the password, the box containing gets opened and consumers obtain their basket. In its advertisements also PopBox claims that it solves three fundamental problems of last mile delivery associated with any E-commerce business. These problems are longer wait time for delivery executive, missing the delivery owing to unavailability at work place, and compromising the privacy of customers. Therefore PopBox with its offering of automated parcel station could able to solve the problem of last mile delivery in E-Commerce value chain. While numerous powers will impact which conveyance models will turn out to be generally embraced, unmistakably the business will keep on experiencing significant disturbance in the coming years. In this segment, we talk about how the fundamental mechanical developments of center work; their potential focal points and restrictions that may hinder reception; and their potential application in the market (Stanford, 2016). A few programming advancements have been enhancing last-mile conveyance in the course of recent years and have opened the entryway for built-up conveyance organizations and in addition, new contestants to offer new or enhanced administrations that better location client desires. Specifically, the fundamental developments that permit conveyance organizations to offer redid conveyance (e.g., on-request or same-day) incorporate undertaking dispatch coordinating and dynamic steering calculations. In the accompanying pages we investigate these and a few different developments and their effect on last-mile conveyance (Stanford, 2016). Purchaser pickup: With cutting edge determining investigation, and more noteworthy perceivability to in-store inventories, retailers can all the more effortlessly offer clients the alternative to arrange things on the web and lift them up from an adjacent store. Frequently this choice will enable both retailer and client to save money on transportation expenses, and clients get arranges quicker. This is additionally an advantageous alternative for clients who favour their requests not to be transported to their home. Group sourced conveyance: Distributed (P2P) and business-to-customer (B2C) organizations utilizing swarm sourcing give people a more adaptable and potentially less expensive option in contrast to conventional conveyance suppliers, for example, the U.S. Postal Administration, UPS, or FedEx (Stanford,2016) . Once the mechanical impediments are settled, administrative limitations are loose, and open worries around well-being and protection are tended to and limited, automatons could significantly affect the scene of last-mile conveyance. Conventional conveyance organizations, new participants to the market, and dealers themselves could utilize automatons to offer same-day conveyance administrations, consequently fulfilling clients’ craving for expedient conveyance in a naturally neighbourly way. So also, mediator organizations could spare expenses by having their workforce centre around looking for clients while utilizing rambles for the genuine conveyance, in any event for those requests inside the automaton’s ability impediments. In the event that the expense to claim and work a very practical automaton turns out to be adequately low with the goal that distinctive individuals could possess rambles for individual item transport, clients could conceivably send their automaton to the store to get their requests. Despite the fact that the utilization of automatons will be constrained to a specific conveyance separation and bundle measure, the market potential is high; for instance, it is assessed that around 20 percent of Amazon’s internet business orders meet these criteria Moreover, retailer Walmart includes areas inside 5 miles of 70 percent of the U.S. populace, making genuine open doors for automaton conveyance (Layne, 2015). Automatons can likewise give a helpful answer for conveying direly required things to remote or difficult to-achieve areas. Automatons as of now have been utilized to convey little guide bundles after the Haitian seismic tremor in 2012, and Specialists Without Outskirts utilized them to transport sham TB test tests from a remote town to the huge waterfront city of Kerema in Papua New Guinea. Conveyance robots are ordinarily focused for generally princely and uncrowded rural regions, gated networks, helped living offices, and grounds. In these settings, they would have the capacity to go on walkways or bicycle paths, customized to go among people on foot, bicyclists, and cars. Robots would travel a short separation from a nearby centre point or retail outlet to a collector, inside 5 to 30 minutes. Customers would have the capacity to plan the conveyance utilizing an “Uber-like” application and may likewise utilize a real-time portable application to track the robot’s area and open the merchandise upon entry (Stanford, 2016). The robot would come back to the conveyance centre point after every conveyance, or it could possibly convey different conveyances, each situated in a different bolted compartment. Robots utilize GPS, sensors, and cameras for route, halting for an impediment or walker in its way. A few models can go here and there checks and little stairs. While a human administrator would track a conveyance robot, it would drive self-governing 99 percent of the time in a painstakingly mapped neighbourhood. Robots commonly have mouthpieces for two-way correspondence. In the event that a hoodlum represented a risk, the human administrator at a control focus could drive the criminal off by means of a speaker and call the police (Stanford, 2016). Since conveyance robots are proposed for less thick regions, their relevance might be restricted. Dispatch’s procedure, for instance, is at first focused on college grounds in California, bearing in mind the end goal to scale into other private regions. Starship likewise recognized that its framework is planned for uncrowded territories. In settings where conveyance robots are material, they can possibly be very fruitful. For instance, on college grounds understudies regularly don’t have their very own vehicles and depend on bikes and open transportation. This can make shopping for food a test. Understudies are additionally more prone to have tight spending plans, so robot conveyance, or, in other words be moderately shoddy, will probably be more appealing than conveyance administrations, for example, Instacart. The innovation would present comparative advantages for seniors in helped living lodging. In the two settings, conveyance could be orchestrated by a market and completed by the store’s very own armada of robots, or the store could re-appropriate to a robot conveyance organization. Another choice is for middle person organizations to offer shopping with conveyance through robot. Robots could likewise be utilized by retail locations or eateries to convey products requested online to adjacent clients. On the other hand, clients could be the ones to start the conveyance procedure, either through an outsider that offers robot conveyance administrations or without anyone else’s input, if later on people possessed robots for individual utilize. Since the scope of conveyance robots is generally little for a long time to come, their utilization for direct conveyance will be more constrained than automatons (Stanford, 2016). A considerable lot of the specialized difficulties related with driverless vehicles are simpler to address when the auto is relied upon to work in a constrained geographic territory, or, in other words of the primary developing business uses of driverless vehicles is as cabs or transports for neighbourhood transportation. A few urban areas are thinking about the utilization of transports and prepares without drivers, which may enable them to extend travel courses and limit more expense successfully because of the normal noteworthy investment funds in labour costs. And Uber is right now constructing its very own driverless auto innovation, and anticipates that this innovation will enable the organization to bring down the cost of Uber rides (Stanford, 2016). Last-mile conveyance is another normal application for driverless vehicles, as this industry shares a large number of the attributes of cabs and transport transports, including extended periods of driving and task in a constrained geographic region. Preliminaries kept running by U.K. government-subsidized research units will test how effectively driverless vehicles can be utilized to convey bundles and different merchandise in London. In the Assembled States, Google acquired a patent in February 2016 for a self-governing conveyance truck, which could conceivably convey anything from the undeniable bundles bought online to promoting fliers and even pizza (Stanford, 2016). Another potential utilization of driverless vehicles is as help vehicles for letter and bundle conveyance, as recommended by a 2014 DHL consider titled “Self-driving vehicles in coordination.” This application could handle the wastefulness related with long-separate strolling at whatever point stopping isn’t accessible near the beneficiary’s post box or front entryway, or, in other words in thick urban territories. Under this model proposed by the examination, the conveyance individual will stroll to every conveyance area (expecting they are close by) with the conveyance vehicle following independently, so the conveyance individual could recover the bundles for every area when achieving the goal. At the point when the help vehicle is about void, a second one (stacked with more packages and letters) would arrive self-governing. As indicated by the examination, the greatest favourable position of this application is its capability to build the efficiency of every conveyance individual, making the activity simpler and in the meantime more attractive (Stanford, 2016). Fernie, J. and Sparks, L. (2014). Logistics and Retail Management: Emerging Issues and New Challenges in the Retail Supply Chain, 4th Edition. Kogan Page. Gevaers, R., Van de Voorde E. & Vanelslander, T. (2011). Characteristics and Typology of Last-mile Logistics from an Innovation Perspective in an Urban Context. In C. Macharis & S. Melo (Eds. ), City Distribution and Urban Freight Transport: Multiple Perspectives (Chap. 3). UK: Edward Elgar Publishing. Gevaers, R., V.D. Voorde, E., & Vanelslander, T. (2014). Cost Modelling and Simulation of Last-mile Chara cteristics in an Innovative B2C Supply Chain Environment with Implications on Urban Areas and Cities. Pr ocedia – Social and Behavioral Sciences, 125, 398-411. Goh, M., Gan C., Chen, K. and Zhang, Y. (2011). 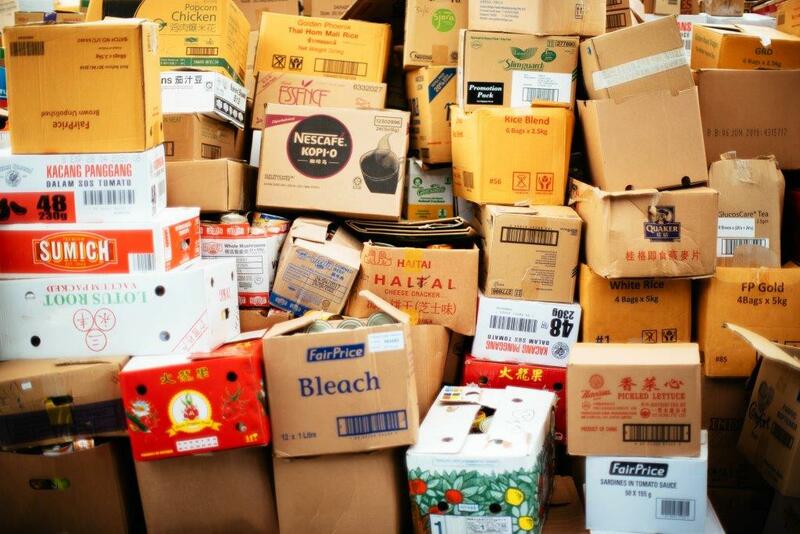 Distribution gains importance as online markets heat up in China. Available at: http://www.atkearney.com/transportation/featured-article/-/asset_publisher/S5UkO0z y0vnu/content/chinas-e-commerce-market-the-logistics-challenges/10192 accessed on October 12, 2018. Iwan, S., Kijewska, K., & Lemke, J. (2016a). Analysis of parcel lockers’ efficiency as the last mile delivery s olution – the results of the research in Poland. Transportation Research Procedia, 12, 644-655. Lee H, Yang K (2013) Interpersonal service quality, self-service technology (SST), service quality and retail patronage. J Retail Consum Serv 20(1):51–57. Lindner, J. (2011). Last Mile Logistics Capability: a Multidimensional System Requirements Analysis for a General Modeling and Evaluation Approach, Available at: http://www.pomsmeetings.org/confproceedings/025/FullPapers/FullPaper_files/025-0 707.pdf, accessed on October 10, 2018. Menge, J., & Hebes, P. (2011). Optimization of urban deliveries: Evaluating a courier,express and parcel services pilot project in Berlin. In C. Macharis, & S. Melo (Eds. ),City Distribution and Urban Freight Transport: Multiples Perspectives (pp. 201–216).